At MCVC we have several pathways to reach our competitive programs. Read on to find out more about our competitive programs, and how you can join! 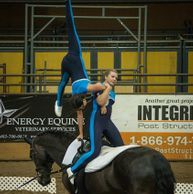 We require all vaulters to have previous experience in vaulting before entering a Competitive Program. Most vaulters will start in our Recreational Program for a minimum of one session (8-12 week program). While some vaulters may choose to enter a competitive program upon completion of one session, other vaulters may choose to continue for additional session before they have reached the skill level to be ready to compete. Best is to talk to our coaches about the pathway that best suits your athlete in the family! Vaulters progressing from the Recreational Program will start out in the Pre-Comp class to continue working on the required skill level to enter competition. 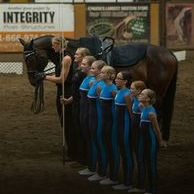 In this class vaulters will experience both Individual and Squad training. 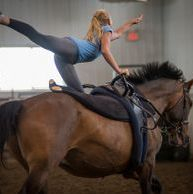 Vaulters in this program will start competing at local competitions hosted in Alberta. And remain pre-comp until they reach a certain level of competition division. Vaulters will be required to attend all scheduled training for this level, show a strong commitment to the sport, and be able to attend cross-training classes as discussed with the coaches of these groups. Vaulters will move up to the Competitive Program once they reach a certain level of competition division. Vaulters progress at their own pace, as divisions for competition are not necessarily dictated by age groups but rather by skill level. 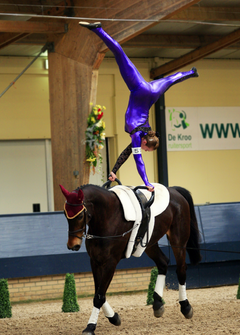 Vaulters may choose to compete Individually, in Pairs or Squad - or any combination of the three! Vaulters may choose to compete at events in all of Canada. Vaulters will be required to attend all scheduled training for this level, show a strong commitment to the sport, and they must attend several cross-training classes each week as tailored to the individuals needs. Once vaulters reach the level of Division B Canter nationally, they may choose to start their International athletic career. Programs from this level on are tailored to individual needs and require a strong colaboration between athletes, parents and coaches. Vauters will be considered for our Elite Program once they reach the Division A Canter Junior/Senior level nationally and 2* CVI level internationally, or Division AA Canter level nationally and 3* CVI level internationally.